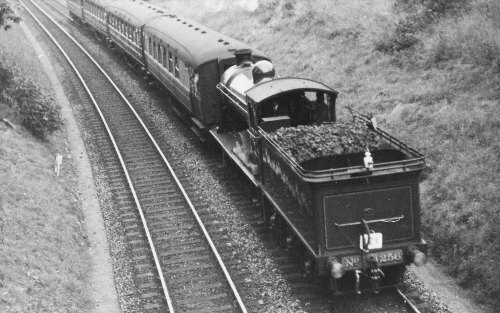 (1) It is unclear why, on the Polton branch, passengers were booked to detrain at Lasswade (the station before Polton) whilst 256 and its train had carry on to Polton to run-round. The route description however did mention the line traversing the valley on a high stone viaduct so maybe it was in poor condition and no longer fit to carry a loaded passenger train? 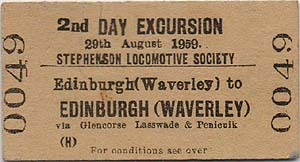 A hand-written note seen by the Webmaster on a tour route description intriguingly states 'also went to within 30 chains of Polton' so suggesting the passengers may have been allowed to stay on beyond Lasswade? 3.30 Portobello East Jn ? 23.64 Eskbank and Dalkeith ? 34.48 Penicuik 17.50 ~ ??.?? 47.69 Duddingston and Craigmillar ? 52.71 Haymarket Central Jn ?